Gruev is an independent two storey villa of 120 sqm that can host up to 7 persons. It is located near Rethymno in the village Skouloufia. The holiday house is designed to provide its guests with comfort and tranquillity and it is suitable for family vacations as well as for alternative tourism. It provides all means of comfort, along with an amazing view that can be enjoyed due to the location that the houses are built on. The interior space of the villa is particularly tasteful and the walls are painted in earthly colours which match perfectly with the outdoor peaceful environment. On the ground floor there is the living room with fireplace, a kitchen and a dining room. In addition, there is one bedroom and a bathroom with shower on this level. The upper floor is accessible via a wooden staircase. Here are two more bedrooms and a bathroom with bathtub. All rooms have large balconies with panoramic views. Water is heated by solar energy, electric heating is available. Water and electricity (including air-conditioners) are included in the prices. 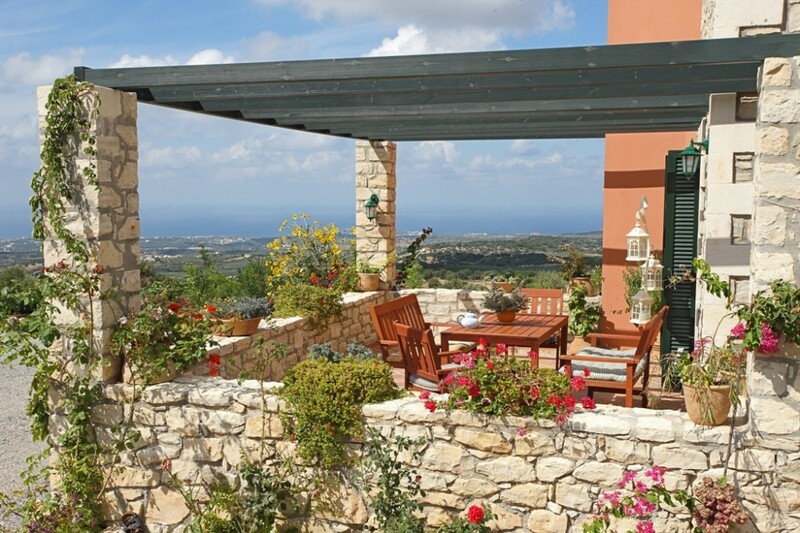 The villa has large private garden, full of olive trees and flowers, that are absolutely secure and suitable for children and provide a lot of space for playing. In the garden you will find a comfortable space with tables and chairs, under large sun-umbrellas, as well as a large barbeque. Also, the villa has its own 40 m2 large freshwater swimming pool. You will also find a small vegetable garden where you can pick fresh Mediterranean vegetables of the season yourself. The location of the villa is a perfect starting point, for unique site seeing tours around the area, such as the Monastery of Arkadi, the Ancient village of Eleftherna, the traditional villages Margarites and Vistagi one of the uniquely beautiful villages in the district of Amari. At the villages in the area, you will also have the opportunity to visit traditional coffee houses and taverns to get a taste of the traditional cretan cuisine. The closest beach is located about 6 Km away, in Stavromenos.